Respiration is the process of breaking down glucose to release energy which goes on in every living cell. In humans, oxygen and glucose needed for respiration are carried around the body and into tissues by the bloodstream. The blood must also carry the waste carbon dioxide from respiring cells. All these substances move between respiring cells and tiny blood vessels called capillaries by a process called diffusion. Diffusion: The movement of particles from an area of higher concentration to an area of lower concentration. In respiring cells, oxygen and glucose levels fall as they are used up in aerobic respiration. At the same time, carbon dioxide levels in the cells rise. As a result, the carbon dioxide diffuses out of the cells and into the capillaries and oxygen and glucose diffuse out of the capillaries and into the cells. Lung tissue is spongy and full of tiny air sacs called alveoli. These are surrounded by capillaries and oxygen that enters the body through the lungs moves into the blood by diffusion. Carbon dioxide also leaves the blood by diffusion into the air spaces. As one gas is entering the bloodstream, another one is leaving it and thus it is called gas exchange. As you work harder your need for energy increases and thus you respire more. During exercise, muscles use up oxygen and glucose very quickly so the blood supply to the muscles must increase (as that carries glucose and oxygen). The amount of blood circulated by the heart depends on heart rate and stroke volume. If we multiply heart rate by stroke volume we get the cardiac output. The cardiac output is the volume of blood circulated by the heart in a given time. Heart rate and stroke volume increase with exercise so cardiac output also increases. However, this extra blood being pumped around the body is useless if it doesn’t contain enough oxygen for respiration. To make sure it does, our breathing rate increases to increase the rate of oxygen uptake in the lungs. However, during intense exercise we can’t supply oxygen to our muscles quickly enough. 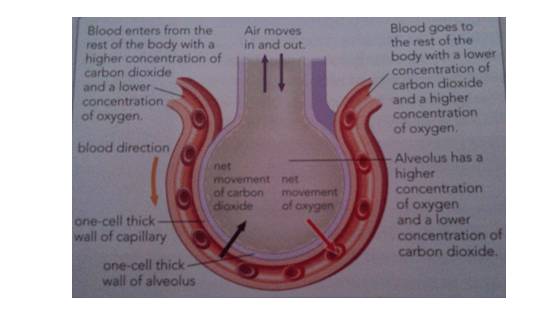 This is when anaerobic respiration comes in – respiration without oxygen. Anaerobic respiration releases less energy than aerobic respiration. The lactic acid produces gathers in your muscles which gets painful and gives you cramps. Lactic acid is broken down using oxygen into carbon dioxide and water. After exercise, oxygen is required to break down lactic acid to produce energy for other processes such as cell repair. This requirement for additional oxygen after exercise is called ‘excess post-exercise oxygen consumption’ EPOC. This extra oxygen can be obtained quickly by maintaining a high breathing rate and high heart rate. The time taken for the pulse rate to return to the normal or resting rate after exercise is the recovery time.